The Sketchy Reader: Autumn Decor and Peer Pressure! *plus* a Fun Autumn Treat Recipe! Autumn Decor and Peer Pressure! *plus* a Fun Autumn Treat Recipe! Everyone is cheerfully decorating their homes for autumn except me, or so it seems. Summer finally arrived here in Alabama last week. We haven't had much of a summer with all the rain, so I'm reluctantly looking forward to fall. I decided to decorate our breakfast room table with a fall transitional tablescape and treat. Really the only thing on the table that is truly "fall-ish" is the treat. Aren't the little acorns cute? The table features reds, creamy whites, browns, mustards, and French blue. Alstroemeria and roses make a simple flower arrangement. I love the little rooster on the runner! The tiny demitasse cups blend nicely with the runner. 1. Prepare ROYAL ICING and place in pastry bag with small tip. Remove wrappers from candies. 2. Place mini vanilla wafer cookies on tray or plate with flat side of cookie toward the top. Squeeze small amount of icing onto bottom of candy piece. Immediately press candy bottom onto vanilla wafer cookie. Allow icing to set. ROYAL ICING: Stir together 1 cup plus 2 tablespoons powdered sugar, 1 tablespoon warm water and 1-1/2 teaspoons pasteurized dried egg whites (meringue powder). Beat at medium speed of electric mixer until spreadable. Add additional water, 1 teaspoon at a time, to get desired consistency. Transfer icing to pastry bag with desired tip. Cover icing and tip of pastry bag with damp paper towel to keep icing from drying out. About 1/2 cup icing. NOTE: I used what I had on hand....small Nilla Vanilla Wafers, Herchey's Dark Chocolate Kisses, Publix Butterscotch chips, and Betty Crocker chocolate cookie icing in the tube. Thanks, Fran, for sending me the recipe! You succumbed! So glad you did, because these are so darn cute and I can almost taste them! Looks lovely chez toi!! As always of course. I love the little demi-tasse cups! I love the fall reds in the runner; they do make the whole table look like you're ready for autumn. You acorn treats are tempting! I'd better go look under the old oak tree and see if I can find some that don't have as many calories! A beautiful table! Those little acorns are so cute, and they look tasty too! Oh this treat is so cute!!! I love your tablescapes and how you do fall in a country chic way. It is very warm in color but lightened with the patterns. Those acorns are adorable! Thank for sharing the how-to with us. Your table looks beautiful, Ricki. You always have such a pretty blend of colors & patterns, which I know is not an easy task to put together, but you make it look effortless! Your table is just beautiful, and colorful...I knew I could expect that from you!! 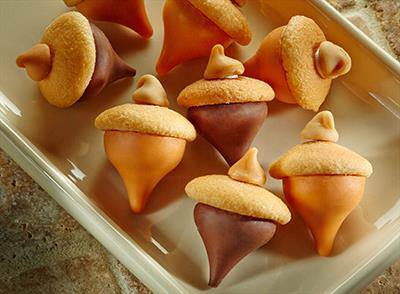 :) Thanks for including the recipe for the acorn treats...I can't wait to try them! Your table is lovely and the little rooster is so colorful and cute! I think Fall colors are the prettiest! Sweet hugs! Love the table. You must have major patience to make the acorns!! Very cute. Those chocolate acorns are so darn cute. I love them. By the way, I can see what you mean about you liking to mix different patterns together. Your table setting is so pretty and so you. I saw Austenland! LOVED IT!!!!!! So, you just whipped up the acorn cookies and decorated the table in between driving shifts and art? You always set such a beautiful table! It's been in the 80's here, so we don't feel much like decorating for Fall, either. Good job! Your table is so pretty! Love the cups. Well you know it's not fall here. Your table is lovely...I know bloggers tend to rush the seasons. It does feel like fall here in Ohio so I am ready! Hope things are going well with your health!